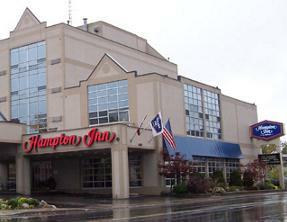 At the Hampton Inn North of the Falls, all guests can enjoy the warm, courteous service that distinguishes the best hotels in the world. Each spacious, comfortable guest room at the Hampton Inn North of the Falls is tastefully furnished and, all rooms are fully equipped with the latest amenities travlers expect. All guest rooms offer a full array of amenities, including such features as coffee/tea makers with complimentary coffee, hair dryers and irons with ironing boards. The hotel’s efficient, professional staff is always ready to meet the needs of each guest; and, this property is just minutes to fine dining, shopping and entertainment. The great Hampton Inn Hotel amenities offered at this hotel include free parking, free breakfast each morning, indoor pool, whirlpool and sauna with a view of the magnificent view of the Niagara Gorge and the Lower Niagara River.